Even by European Union standards, the response to the so-called refugee crisis is a mess. This seems to defy logic: While the crisis is certainly a challenge, human rights – and, indeed, refugee protection – are embedded in Europe’s DNA. Moreover, the EU’s aging and demographically challenged member states need immigrants. Yet, instead of spurring solutions, the current crisis has been bringing out all that is ugly, feckless, and dysfunctional about the European project. What happened? As is so often the case with the EU, the problem is a lack of clarity. The blurring of the lines between refugee and immigrant has made it virtually impossible to make compelling arguments in favor of proper refugee protection or more effective immigration policy . This has thwarted honest and constructive discussion, allowing those who peddle fear and nativism to gain ground. Central Banking’s Final Frontier? Anatole Kaletsky weighs the views of Raghuram Rajan, Adair Turner, Stephen Roach, and others on how far today’s increasingly exotic monetary policies can and should go. Some European populations, frustrated with the EU’s handling of past crises, had already begun to fall prey to nationalist sentiment; so it was not difficult for populists to portray the hundreds of thousands of refugees streaming into European countries as a new threat to national identity. Chaotic border scenes from Calais, Macedonia, and Kos reinforced the image of disorder. Finally, the horrific terror attacks in Paris and Brussels, though carried out by European nationals, infused a profound sense of insecurity into the discussion. When all of these challenges are lumped together, the problem seems intractable, creating the impression that an isolationist response is EU countries’ only hope for protecting themselves. But what Europe actually faces is three distinct challenges: protecting refugees, as required by European and international law; developing an effective and sustainable immigration policy that will benefit the EU; and responding to the discontent of second- and third-generation immigrant communities in Europe. When considered separately, effective solutions begin to emerge. In terms of radicalization among communities already living in Europe, much has been said, particularly following the attacks in March in Brussels. What too few have pointed out is that these are Europeans. Dealing with their restlessness and frustration within the context of immigration will only alienate them further. As for the refugee challenge, the solution must begin with clarity about Europe’s actual responsibilities. The duty to provide protection to those with a “well-founded fear of being persecuted” is contained in the United Nations Convention relating to the Status of Refugees , and reinforced by the Treaty of Lisbon . In other words, the EU must protect those who face imminent danger if returned to their home country, not everyone arriving at its borders. Moreover, that protection is not supposed to be permanent. When it is safe to return home, those who have not obtained permanent residency or citizenship should do so. Everyone must understand that the obligation to protect people fleeing persecution has its limits. To be sure, Europe should not be shouldering this burden alone. The entire international community should be doing its part. In 1979, an international conference was held to respond to the refugee crisis that arose from the end of the Vietnam War and the mayhem of the Khmer Rouge genocide in Cambodia; over the next two years, more than 620,000 refugees were resettled in 20 countries. Such cooperative action is badly needed today. As long as the rest of the international community fails to fulfill its responsibilities toward the refugees, it will remain difficult to convince a skeptical European public to do so. Clarity is similarly vital in addressing immigration. Welcoming immigrants is in Europe’s interest. But precisely which immigrants should be up to Europe. Yet neither the EU nor any of its member states has a coherent immigration policy with this end in mind. This must change, with the EU demonstrating its capacity to attract the talent and labor needed to ensure economic growth and competitiveness. 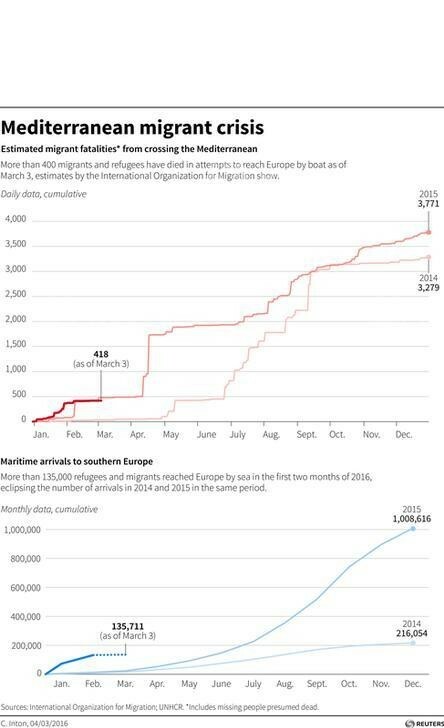 Beyond appropriate refugee and immigration policy, Europe needs proper tools for implementation. No amount of messaging and incentives will work if the borders are not secure or immigration rules are not being applied effectively. It has been said that differentiating between refugees and immigrants is code for excluding everyone. That is not the case. A more precise understanding of the distinct problems facing Europe is vital to resolving them. If we are to address the discontent of marginalized communities within Europe, we need to understand the factors underlying it. If we are to meet our international obligations toward refugees, we need to know what those responsibilities are. If we are to ensure that immigration benefits both the newcomers and their host communities, we need to identify what benefits we are seeking. Without such clarity, populists seeking to tear us apart with their simplistic xenophobic propaganda will thrive.